I love to feel the flow that Hula Hooping brings my body. 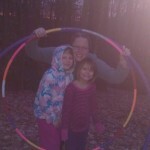 The girls and even Jody enjoy giving the hoop a spin as well. I don’t have many pictures of myself hooping because I am usually the photographer for our Captured Moments. 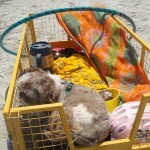 I mainly have pictures of the homemade hoops hanging around(like the one of it laying on the wagon with Emmie at the beach and on the front of the bus). Lydia captured the pics of me and her sisters. 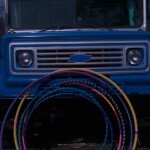 When deciding in scaling down on possessions prior to moving into the Bus, there was no question of whether the hoops would make the cut, only the question of where to store them. They have found a home strapped to the side of the bus because space inside is precious and it is cool to show them off as we drive down the road. We made a few different sizes out of black water-pipe line and duck tape. If you have never tried to hula hoop or if it has been a really long time, keep in mind the bigger the hoop- the easier it is to keep it spinning. So……if you meet us along the road we would love to share our hoops with you and let you try giving them a whirl……. 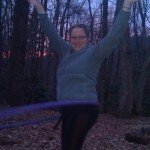 This entry was posted in Hooping on May 24, 2012 by Chasity. You look like you’re having fun! My 8 year old hula hoops pretty well, but I’ve gotten horrible at it. My 6 year old doesn’t have the patience to “practice” for more than 30 seconds.